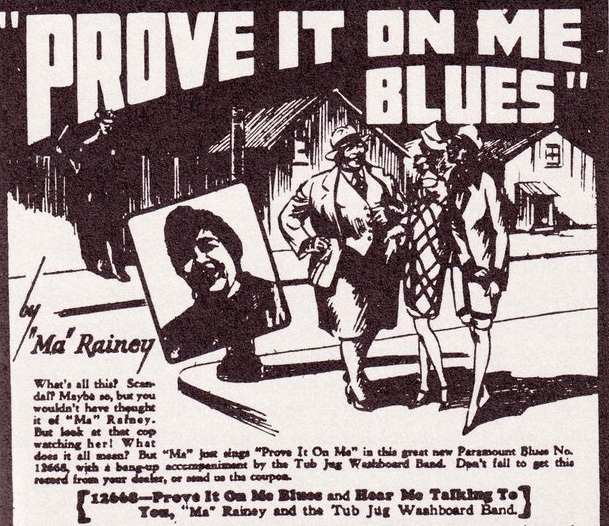 Gertrude “Ma” Rainey’s Prove it on me blues affirms her independence from orthodox norms by boldly celebrating her lesbianism. Rainey’s sexual involvement with women was no secret with both colleagues and audiences. The advertisement for the song (above, click to enlarge) shows her dressed as a man, obviously flirting with two women, while a policeman keeps an eye on her. Today is Rainey’s 130th birthday! Below, the 1928 recording.